When should I turn on my irrigation system? With the warming up in temperatures we’re asked this one question often. The answer is no, not in the winter months. Grass is still in a dormant stage and does not need anything more than what it gets naturally from rain. Now is the time to have your irrigation system checked though! Making sure it is working properly, no leaks, cracks and making sure all the sprinklers are still watering where you would like is what you should be doing. Beach Landscaping can help you with this if needed. Checking the pressure, amount of water that the irrigation system is using to water and the timing are all very important and can easily be done by a home owner. Many people set up their irrigation system to over water their lawns and water at the wrong time of day. There are many articles to guide you through a DIY project but the Clemson Edu website has very clear and concise instructions on how to check and calibrate your irrigation system. What most will agree on is that you should water infrequently but heavily and in the early morning. You can experiment with how often you need to to turn on your system once growing season starts. Water, then later in the day test the soil for dryness. Then check to see if the blades spring back up or stay flat after walked on. These tricks will help you establish your watering schedule. If there is a severe drought or dry season the schedule would have to change to reflect that. 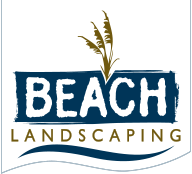 At Beach Landscaping we are happy to answer your questions! We will help guide you or will do the work for you on your irrigation system if you desire. At Beach Landscaping our grass is always greener!! !